As children we used to make 'witch fingers' with poui flowers. It's something I still do from time to time. Some of you may also remember making the 'witch nose' by removing the small yellow 'thing' from inside the Hibiscus flower and sticking it onto your nose like a wart. 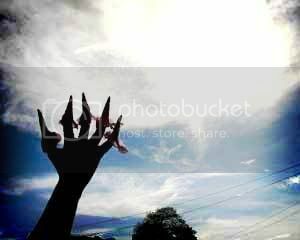 Silhouette of my hand against the afternoon sky, with poui flowers on each finger creating the witch-fingers effect. 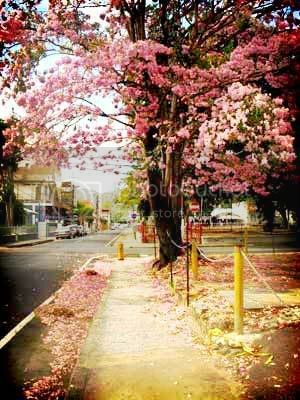 Pink/Purple Poui Tree on Abercromby Street, POS. Poui blooms are generally bright yellow (golden) or pink (sometimes darker pink, appearing to be purple ... or paler pink, appearing to be whitish). They say, whenever you see pouis in bloom, it means it's exam time for students. 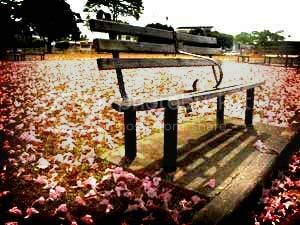 (In the park near Carlos Street, Woodbrook). Falling from above and carpeting the ground, poui flowers always remind me of 'tropical snow'. those pics are awesome. Vivid and full of life.